In one minute flat, customised MA CREME is prepared before your eyes with IOMA In.Lab! Never before has customisation gone this far. After Taïwan, IOMA is now present in Malaysia, Hong Kong and most recently in Iran. With the opening in Qatar in June, IOMA established itself in the United Arab Emirates (Abu Dhabi and Dubaï) and in November at Areej, Bloomingdales and Harvey Nichols. The IOMA X .Kate Lee Christmas Case combines Paris' chic and the world of leather goods. Kate Lee has a best-seller with IOMA Lip Lift ! 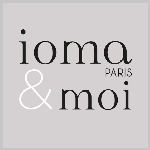 IOMA Paris celebrates one year with La Boutique! Located in the heart of Paris, in the Saint-Germain district, La Boutique IOMA Paris has just celebrated its first anniversary along with many personalities and loyal customers. 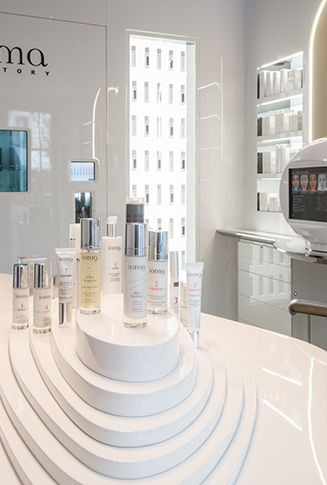 Located in the heart of Paris at 77 boulevard Saint-Germain, the first IOMA Paris store is a genuine techno-temple dedicated to beauty. Following the success of IOMA Paris in Indonesia and Singapore, IOMA continues to expand in Asia by entering the Taiwanese market. 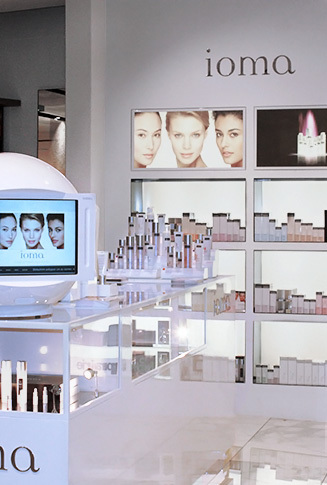 IOMA Paris extends its distribution network, selecting pharmacies involved in the over-the-counter drugs and personal hygiene products and the beauty sector. The app attracts new fans each day, with up to 15,000 users recently! Working with its long-standing partner Marionnaud, IOMA Paris is continuing to expand in Spain and Portugal. In 5 years, IOMA has managed the feat to set up in 17 countries and 3 continents with 3 models: pharmacies, department stores and perfumeries. In total, 1,500 sales outlets offer IOMA care. IOMA has networked 2,200 skin diagnostic devices worldwide, capable of continuously feeding the data in the IOMA Skin Atlas. 10,000 users for the IOMA A MOI apps. The IOMA A MOI app. has reached 10,000 users worldwide. IOMA created its first e-commerce site with the possibility of making personalised treatments from among 80 514 formulas and 50 pre-prepared products. 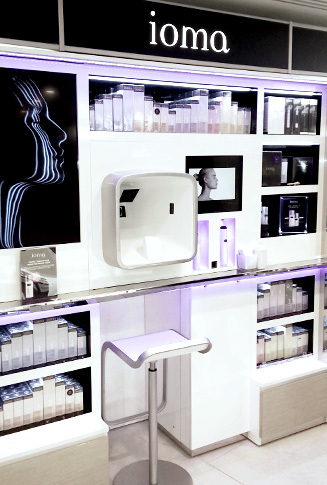 The IOMA site is one of the leading face treatment sites in the world in terms of the number of products available. - opening of the first flagship IOMA Revelation in Jakarta, Indonesia, a unique area of over 60 m2 with all IOMA technology. - deployment of the brand in Italy, Russia and the flagship stores of the Boots brand in the UK. - launch of travel retail at Geneva airport. IOMA is launching the first mobile app. to give the UV index wherever you may be for the next 48 hours. 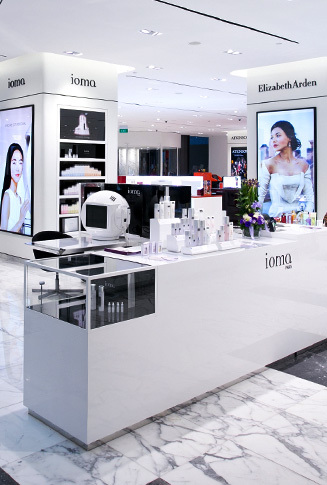 IOMA is opening its first store in Asia, in Singapore on the famous Orchard Street at Robinson. IOMA continues its growth in Europe and is now present in Belgium, the Netherlands and Luxembourg. To accelerate its deployment in Asia and its research capabilities, IOMA is forming a strategic partnership with Unilever. 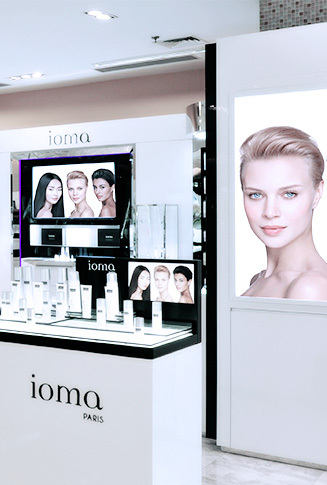 IOMA launches its first corner in the most famous department store in the world, Harrods, in London. 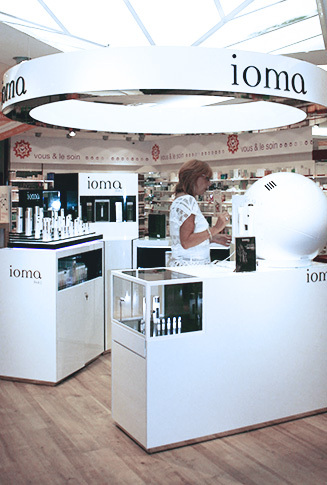 Less than two years after its launch, IOMA is now present in 500 perfumeries in France. After unprecedented business results in 3 test perfumeries, IOMA opens at Marionnaud with a diagnostic device in each perfumery. Launch of the brand in pharmacies in Spain. Jean Michel Karam – partner at Vera Strubi, the creator of the famous Angel perfume by Thierry Mugler, has created the IOMA treatment range (meaning mine backwards). A new cosmetic is born: personalised cosmetics. Beauty Success is the main partner of IOMA; its success was immediate and its listing was extended to the entire network.